Ah! I finally saw the cover for this on Goodreads, and was so excited to see it! It really is gorgeous, and I love this series. I neeeeeed to know what's going to happen with Jacinda, Will and Cassian! I can't wait to check it out! I love how the dark background makes the colours pop. All the covers in the series have been gorgeous. I have to admit that I haven't read a single book from this series. I had a German ARC for the first book but never found the time to read it. 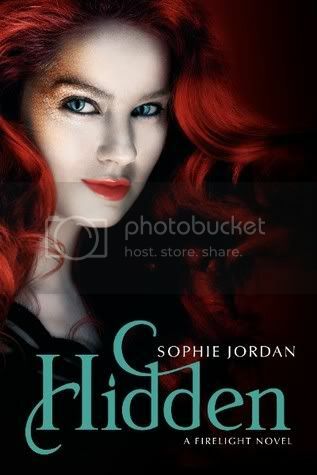 I'm also dying to read Hidden! The other day I saw the cover. Gorgeous as always! I've read Firelight and liked it and I really like the cover on the second book but I haven't read that one yet. Great pick this week. The colors on the cover are so rich and loverly! OMG I haven't seen this yet! I'm SO SO SO excited for this. Team Cassian alll the way! Soooo can't wait either!! Saw this just the other day!! Very excited! I just finished Vanish (if it wasn't on my Kindle, I would have thrown it across the room!) and I'm not sure if I want to read any more... Still, I like how Jacinda looks like she's older and wiser on this cover (she REALLY needs to grow up). I haven't read this series, but it sounds like I need to right away. They have some pretty awesome covers. Hope you get to read it soon! This series is so good, I am dying to read this one as well! Sophie Jordan is the queen of the cliffhanger. Ahhhhhh! So excited for this! I'm totally in love with Cassian after Vanish, but I know she's going to end up with Will and that's going to make me very sad. I like Will, I just developed a huge soft spot for Cassian! I so need to read Firelight so I can wish for Vanish & Hidden. I didn't like Firelight enough to continue the series ... But the covers of this series are all gorgeous :) ! Great pick Christy !! Great pick! I really need to read this series--I adore dragons, yet somehow I haven't picked these up. Definitely going to get the first two as soon as possible. I'm really not sure if I'll be looking forward to this one yet or not. I read Firelight and had a few minor issues with it so I'm hoping for more from Vanish before I decide about continuing on to read Hidden. I do love the cover though. This is a gorgeous cover. I've only read the first one but now I really want to read Vanish so I can read this one right away when it comes out. Great pick, Christy! I haven't read these book series yet, but I love the covers!